Just getting here is part of the adventure: the 30 minute drive from Austin takes you through Texas Hill Country to the top of a bluff, where Vintage Villas opens onto a view of Lake Travis. Three separate villas house large, private guestrooms, many west-facing with big windows and balconies to take in gorgeous sunsets over the water. Two adjacent buildings house meeting and event rooms. Each villa has its own style: one Southwest rustic, with rooms painted a cheeful yellow and lassos and other hallmarks of cowboy culture on the walls, one Victorian, and one Texas country. Look for photographs and paintings by Southwest artists, on display in public spaces and guestrooms. Deluxe contintental breakfast, including one hot item plus fruit, pastries, yoghurt, coffee and tea, is served on weekday mornings. On weekends, wake up to a full buffet breakfast with hearty morning dishes like omelettes and French toast. The staff at Vintage Villas are expert at weddings, and both corporate and leisure group events. They offer indoor and outdoor venues overlooking Lake Travis, plus full event services. 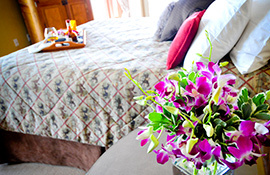 Vintage Villas Hotel & Events is on the shore of Lake Travis just 30 minutes from downtown Austin. Queen and double queen bed guest rooms have either a double size shower with double shower heads or a more traditional tub and shower combination. 72 hour cancellation policy for individual room reservations.